It’s bored .50 over. 18cc domes and wiesco racing pistons. New needle bearings n stock crank n rods just lightened up. V-force 4 reed valves. Fully turned n jetted 26mm carbs. Oil ratio 40:1. Do I need to run race fuel or can I mix the vp110 with pump gas wether it’s 87 or 89 or 93?? If not and best to run straight race fuel mixed with the oil what would I have to change out on the motor so I can use pump gas?? not the leading authority on 2 strokes here but in general the higher your compression the higher octane fuel you have to run. running higher octane fuel than your compression ration calls for is just a waste. you say you have racing pistons and larger domes but you dont mention a compression ratio. if you new that number someone (not me ) that was really familiar with hopped up 2 strokes could tell you a minimum. my best guess looking at that motor and going of the things you said you wont be able to run straight pump gas but you might be able to get away with a mix. for day to day stuff my buddy runs about 1/3 vp 2/3 clear super in his and he bumps it up if he needs more hp. passing on what he has told me that mix is the minimum he needs to get it to start and run without pinging (detonation ) if it was me i would start at 50/50 and see how it starts and runs, pay attention to how the motor sounds on straight race fuel and how it sounds on you mix. dont let it ping you could destroy a piston. watch your plugs for a lean condition. adjust you mix to something you can live with. as to what you could change to make it run on pump gas, you would need to replace the head and or possibly the pistons depending on how the engine builder bumped up the compression. unless the guy provides you with a build sheet it is going to be tough to tell exactly what you have and what octane you need. i have met guys that build "race" motors that they run on race fuel, not because the need it but because they read bad information on a forum or their buddy told them something and they were just wasting money. again not a banshee guru but that motor looks to be pro built and has some serious go fast parts. 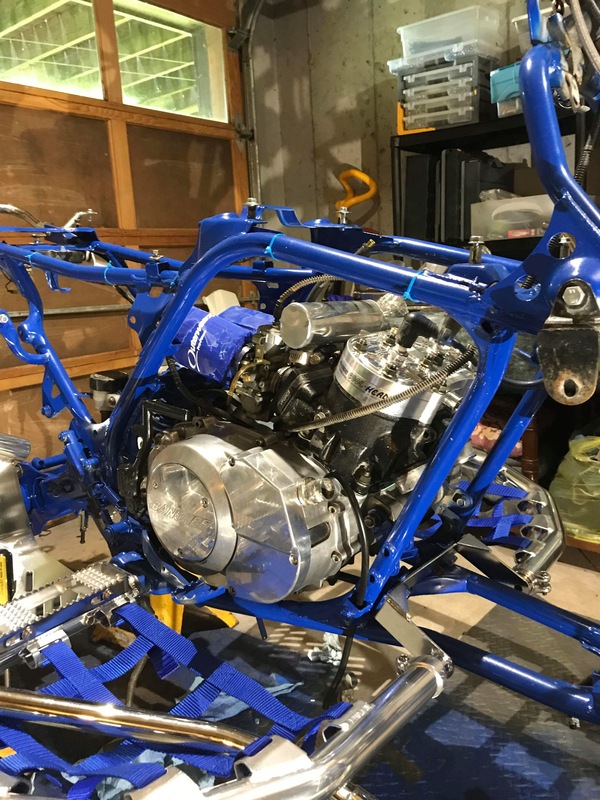 it is really easy build a motor like that because if you have to do a complete rebuild it is not a ton more money to pump it up. here is my guess the guy spent some time on the internet dreaming about the fastest banshee at the dunes, dumped a ton of money into your bike and after a trip or 2 realized 25 plus bucks a gallon for fuel was not much fun and sold it to you for 30 cents on the dollar. long story short spend some time trying different mixes until you find a good combination of power and price ( keep in mind depending on the compression ratio you may have to run straight race gas ). 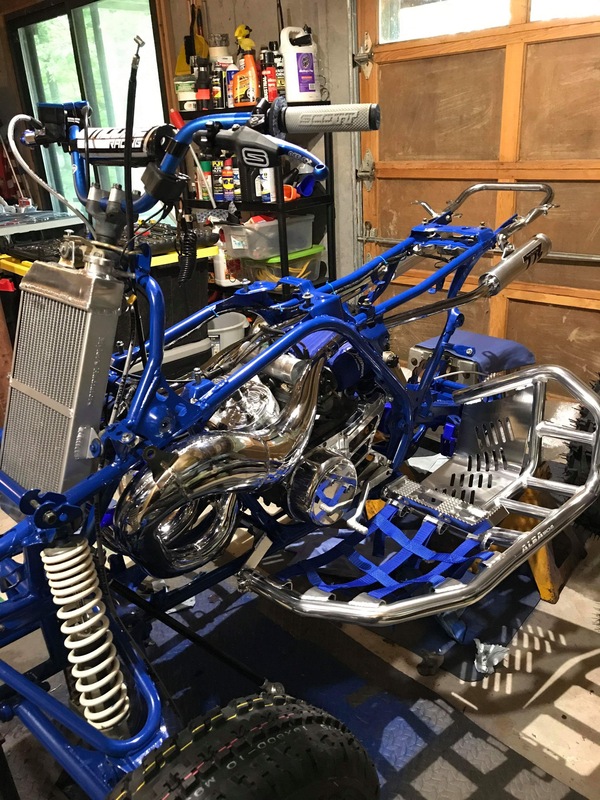 i would install a good temp gauge if you are going to ride that beast in the trails because it is going to get hot , and i would make sure i was dialed in on jetting it. i think it is going to be pretty sensitive to altitude, so depending on you local trails you may need to jet a lot. Never mix fuel, can lead to a blown engine because of mix ratio. If you want to run pump (91), you need to switch out the domes to something like 20/21cc. Alright. A little more info that can help me understand it more. I donâ€™t know the compression ratio but the kid said he did drag it a few times so.. how would u change the compression ratio?? I wanna throw bigger rear tires on it also..
You can buy a set of 20cc domes to lower the compression. They are inexpensive and easy to change. Myself I run 18cc domes and mix 100 octane and 93, done it for years and never had a problem. I run a 50/50 mix. I know anything close to a 50/50 mix is good enough to prevent detonation. That is all you need to do. And my banshee is not a garage queen it lives in the dunes and has been to trails all over the Midwest.